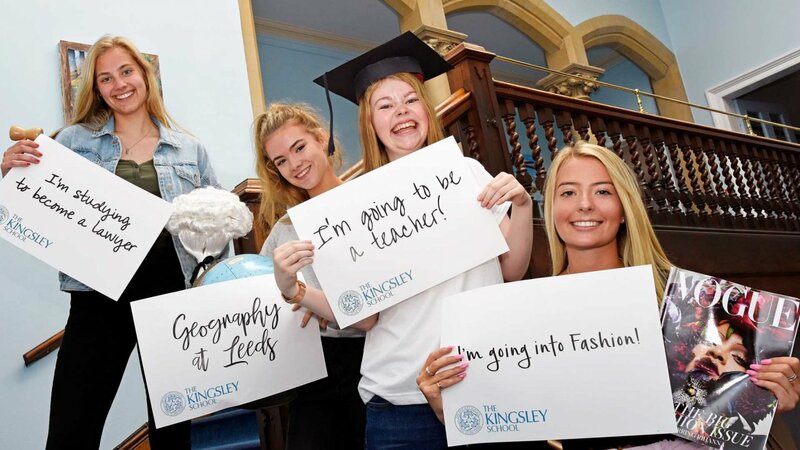 Kingsley girls, their parents and staff are celebrating fantastic results and outstanding personal achievements that have secured a diverse range of choice destinations for their leavers this year. The Kingsley School Sixth Form has excelled, with top grades 10% above the national average. The school achieved a 99.9% pass rate with over a third of all grades A* -As. Nearly two thirds of grades were A*-B and 82% A*-C.
There are also a number of girls who accepted unconditional offers, including Charlotte Dennison, ABB, for Events Management at Oxford Brookes and Steph Robinson for Veterinary Bio Sciences at Aberystwyth. Emilia Atherton will also be undertaking an apprenticeship in Primary Teaching.